After increasing three dress sizes in three years, 36-year-old Sarah Caswell was feeling desperately unhealthy. A size 18 going on 20, she was tired all day, unable to sleep and constantly coming down with colds and viruses. “I had so little energy and I was putting on weight so easily I began to think something was seriously wrong,” she says. But it was only when she signed up for a nutrition and fitness programme run by David Marshall, known professionally as the Bodydoctor, that Sarah began to see the ways in which her lifestyle was damaging her health. When David saw Sarah, he realized that her weight gain, fatigue and general ill-health could be indicative of Syndrome X, a disorder usually associated with inactivity and a diet high in saturated fats and hidden sugars, particularly from refined carbohydrates. A recognized epidemic in the US, Syndrome X – also known as metabolic syndrome – now affects one in five British people, according to researchers at Leeds Metropolitan University. It occurs when the body becomes insulin resistant and is unable to process sugar and fat efficiently. In addition to insulin resistance, sufferers usually have a cluster of related symptoms, ranging from obesity (particularly a high waist-to-hip ratio) to high blood fat and sugar levels and high blood pressure. In effect, it is an early warning of more serious conditions, such as diabetes and heart disease. However, international trials show that a healthy diet and regular exercise can reverse the condition. Indeed, Sarah discovered that following the six-week Bodydoctor programme, was a sensible and highly effective way of rebalancing her body. She was in good company. David has used the same philosophy to help celebrities such as Sophie Dahl and Rachel Weisz achieve their svelte physiques, and to take top footballers Rio Ferdinand and Trevor Sinclair to the peak of their strength and fitness. Sarah continued to attend the gym three times a week, following David’s unique sequence of 23 resistance and stretching exercises. This works like a yoga sequence, using heat and breath, and with each exercise counterbalancing the previous one in a way that feels natural for the body. 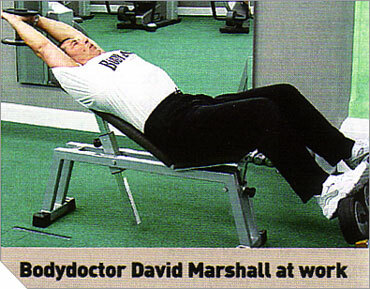 According to David, doing more repetitions at a lower resistance is the most efficient way of burning fat, both under the skin and within the muscles. As the body gets stronger, leaner and more flexible, it starts to burn more calories, even when stationary. David advised Sarah to “turn off the fat supply” by cutting out sugar and replacing refined carbohydrates with those that release sugars more slowly, such as brown rice, wholemeal pasta and bread. He also encouraged her to food-combine – eating carbohydrates before exercise for energy, and protein afterwards to build muscle.